It’s expensive and inefficient to manage video this way. However, there is now a single technology that solves the biggest challenges organisations face when it comes to using video to enhance teaching, learning and training – a video content management system, or video CMS. A video CMS is a secure, central platform designed for creating, managing, and sharing video content. A video CMS is built to store large video files and support huge video libraries. There is theoretically no upper limit on the size of a video file you can upload or the number of videos you can store in your video CMS. Even if you’re sharing an eight-hour video from an all-day course (a video file that may be 30-40GB in size), you can upload it as-is to your video CMS. Most video CMSs also offer a cloud-hosted option (in addition to an on-premise model), which takes advantage of plummeting cloud storage prices and economies of scale that bring cloud storage costs to almost zero. These systems were designed to scale up, so even as your video library grows larger, your costs don’t increase. Today’s video CMSs include built-in transcoding engines. This means that the video CMS will standardize every video you upload, whatever the file type, so it can be played back on any device. No one in your organisation will ever have to spend time testing and converting video files again. Your learners will be able to access learning content using the device of their choice, whenever, wherever. When thinking about scaling up with video, there’s an important technical hurdle to clear for most organisations: the available bandwidth on your network. A video CMS can assist here through the use of ‘modern video streaming’ – an approach which means learners don’t download videos in their entirety. Instead, the video CMS splits each video into tiny sequential segments (called “chunks”). These chunks are sent to the learner’s device one-by-one, played by the device, and then thrown away. As a result, devices like smartphones (with limited storage) never run the risk of running out of space. Modern streaming also supports ‘adaptive bitrate streaming’, meaning that during playback, the video CMS optimises playback for the viewer’s network connection by continuously detecting the available bandwidth in real time. Even if the viewer’s connection changes during playback, the video CMS will adjust the quality and bitrate of the video stream accordingly. Automatic speech recognition (ASR), which extracts the audio from a video, recognizes what’s being said, timestamps it, and adds it to a search index. Optical character recognition (OCR), which recognizes the text that appears on-screen (in slides and on-screen recordings), timestamps it, and adds it to the search index too. Learners will not only be able to find a video from your library in which a specific topic is addressed, but they can also fast-forward to the exact moment in the video their search term gets mentioned. 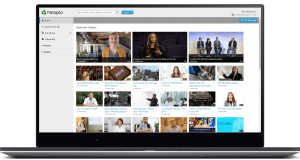 User analytics in a video CMS can show you who’s watched what and where they stopped watching minute-by-minute, enabling you to confirm virtual attendance in a course, as well as completion. Meanwhile, aggregate data for videos that show sizable dips in viewership can help instructors pinpoint segments they may want to rework. These analytics capabilities typically integrate with learning management systems. For example, video viewing statistics and completion data can be shared with the LMS via SCORM, and if the video CMS offers public APIs, they can be used to programmatically integrate video reporting with even more systems. If you want to make video learning easy at your organisation, you can learn how during Panopto’s Discovery Demo session, on 6 December from 12.00 and 13.00.